Last night’s event in Austin went splendidly. The folks at BookPeople—Mandy, Topher and Emily were wonderful hosts. Emily mc’d brilliantly and we were asked lots of very smart questions. Many we’d never been asked before. I really like the Actor’s Studio format, which meant there was no awkward oh-noes-there-will-be-no-questions-tonight moments. It was a lot of fun to do an event with Scott again which we haven’t in ages. 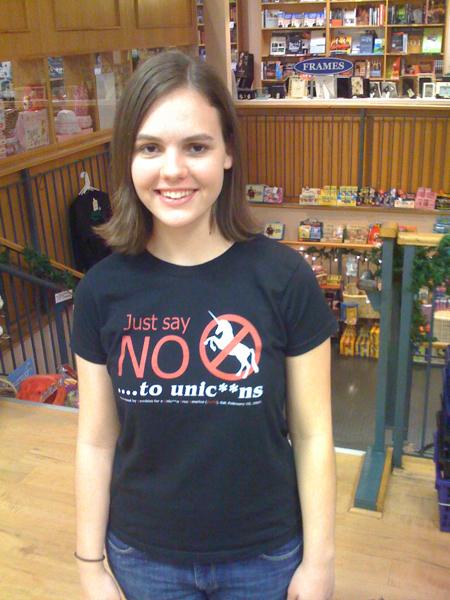 Rebecca’s superb anti-uni***n T-shirt. Doesn’t she look fabulous? She made me one too! Thank you, Rebecca, it fits perfectly. I’ll be wearing it here at NCTE. Texas is always so good to me. Posted in Book tour, Fans & readers, How To Ditch Your Fairy, New York City/USA, Publishing business, Scott's books. I pretty jealous – that’s a very fashionable tee! I’m SO looking forward to the ZvU anthology! It was great having you at BP last night, I hope y’all enjoyed it as much as we did! And shoot me an email if you want the parking fairy shirt, I’d be happy to send it to you! What does it say underneath the big writing? Thanks again for the awesome event!!! You and Scott are always so entertaining. This is probably old news to you, Justine, but I think I found the perfect reconciliation film for you and Holly–Stardust. It has a unicorn AND a zombie! Well, kind of a zombie. You’ll know what I mean if you’ve seen it. And it’s Neil Gaiman, so kind of enough said there!